Last year, fRETfEST offers an open opportunity for musicians to come forward and sing a song for a worthy cause, live on stage at WINTER SONGFEST. This year, $300 was raised for Lifeline at the SONGFEST 2013 on Sunday 18th August at the Broadwater Parklands. A new guitar was given away and about 100 people gathered on the Great Lawn on Sunday at the parklands on a picture perfect winter’s day to enjoy the free family music event. Guitar winner, 54yo Lifeline Volunteer, Taryn Mansfield, entered Songfest on Sunday at “the last minute”. Unbeknown to the organisers, Taryn is a 6 Year Service Volunteer at the Southport Lifeline Store and she entered SONGFEST “for fun!” she said, although she never expected to win! She sang, “Give Me A Home Among The Gum Trees” which was originally written in 1974 by Wally Johnson and Bob Brown (aka Captain Rock) and popularised in 1982 by Aussie Bush Band, “Bullamakanka”. The song later became a favourite of Slim Dusty and John Williamson and Taryn was just happy to sing the song and enjoy the day. Other entrants ranged in age from as young as 13 and most sang their own compositions, astounding the audience with the array of song-writing talent on display. The local entrants were joined on stage by 14yo Asha Jefferies from Brisbane, 14yo Jeremy Brand from Caboolture, music graduate Lauren Crick from Logan and a young man who is fast becoming internationally renowned as an acoustic guitarist, Van Larkins from Redcliffe. SONGFEST organiser, Al Buchan said he hopes these events will stimulate more local songwriting talent on the Gold Coast and encourage more musicians to become involved in the future. SONGFEST was staged with the support of The City Of Gold Coast, the Broadwater Parklands, Guitar World at Nerang, Local Southport Area Representative CR Dawn Crichlow and State MP, Rob Molhoek who were all there on the day to show their support. Both Dawn and Rob spoke at the event. 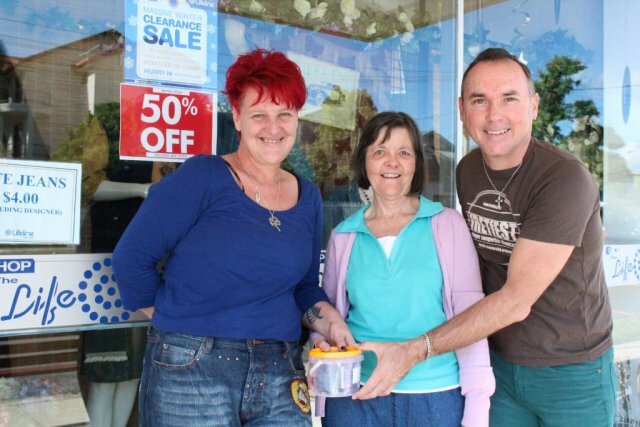 Pictured, Lee Mooney, Taryn Mansfield and Al Buchan handing over $300 raised! For more details about what might lay ahead for you, check out the Mentorship page at www.fretfest.com/mentorship and contact us today to see how we can help kick-start your music career.